Located on the shore of Powell Lake near the Townsite District of Powell River. The Shinglemill is set in a beautiful waterfront location and serves great pub-style food and seafood. The site of an old mill that produced shingles for the Powell River area, currently the restaurant is located next to the only marina located on Powell Lake, making it a great place to sit on the deck in the summer and watch people coming and going from their cabins up Powell Lake. Perhaps the best setting and view in the area! The Lund Hotel is located 30 minutes drive north of Powell River. 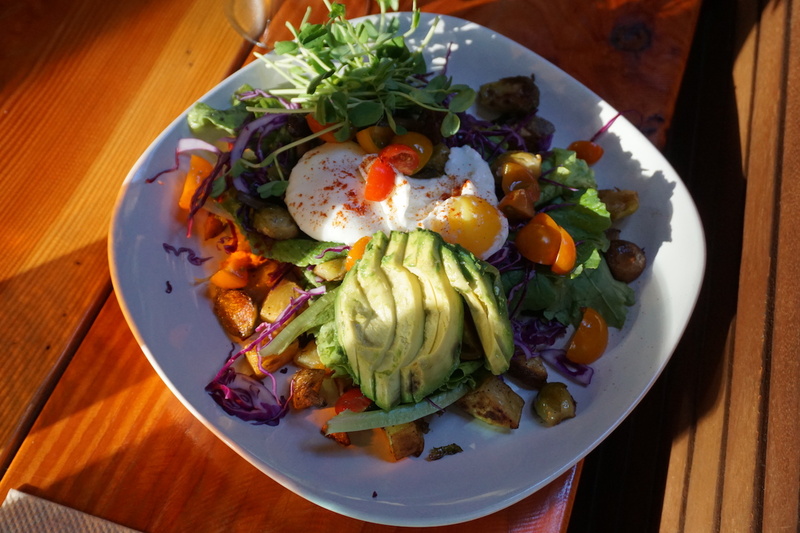 It is a traditional pub with great history that serves burgers, seafood, pastas and other meals with expansive views over Savary Island, the northern Salish Sea, and Vancouver Island. 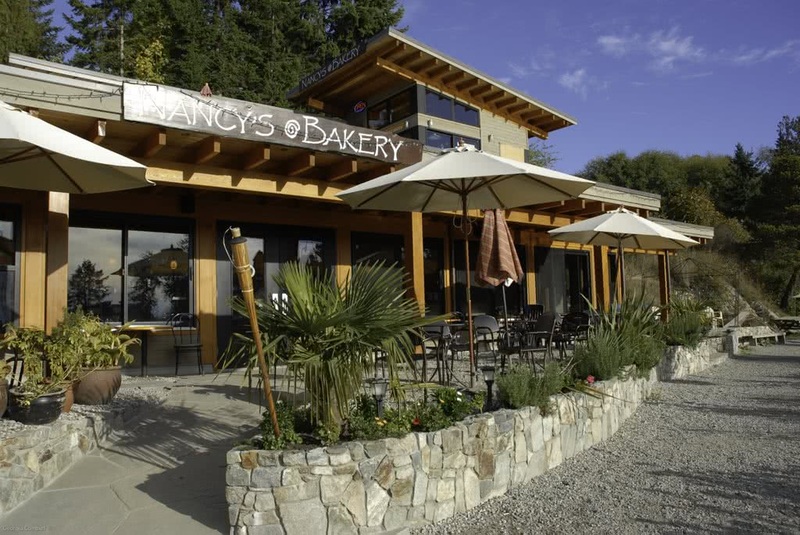 Nancy’s bakery is world famous for their blackberry cinnamon buns! The restaurant and bakery sits above the Lund Harbour, serving tasty, local, healthy meals in another stunning setting. The friendly atmosphere makes the bakery popular year round. Rocky Mountain Pizza is located on Marine Drive in Powell River and serves great coffee, sandwiches, breads and baked goods. It is a comfortable place to hang out for a while or grab a quick bite while waiting for the ferry to Vancouver Island. If you’re staying in the Townsite or enjoying a beer at the brewery and have the craving for a good pizza, then the Granada is the place for you. Located on the highway across the road from the Old Courthouse Inn, the Granada does great pizzas as well as delicious Greek inspired cuisine. 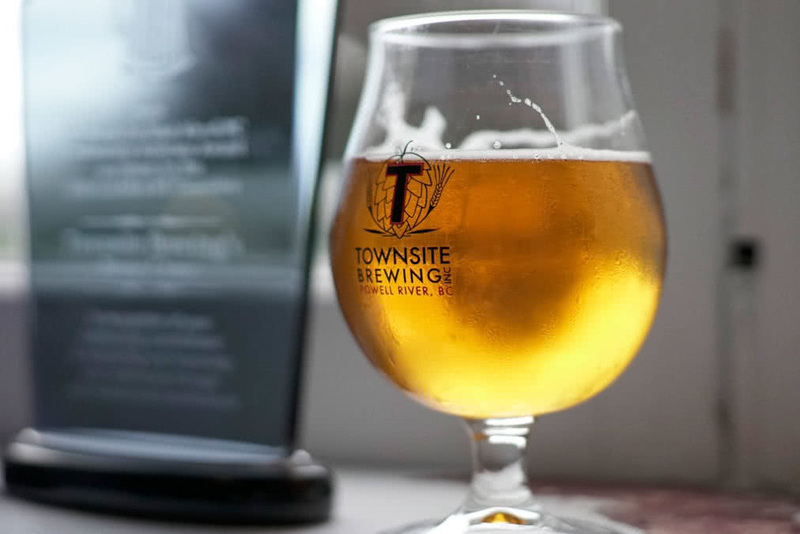 And as the brewery allows patrons to bring their own food inside to be enjoyed, you can place a call and pick up your food quickly so as not to miss last call! Paparazzi Pizza is a locally owned pizza place that delivers to anywhere in Powell River, 7 days a week. They have great gluten and dairy free options as well – great for groups with differing food preferences that want to enjoy a night in before or after their kayak trip! Awesome Japanese restaurant next to the new Powell River Public Library. Minato offers a wideselection of sushi rolls, sashimi, and other dishes with a private and authentic atmosphere. Seriously good sushi! Little Hut Curry serves gourmet cuisine from the north of India with unparalleled service and attention to detail. Located in a cool little house on Marine Avenue in Powell River, which adds to the relaxed charm and ambiance. 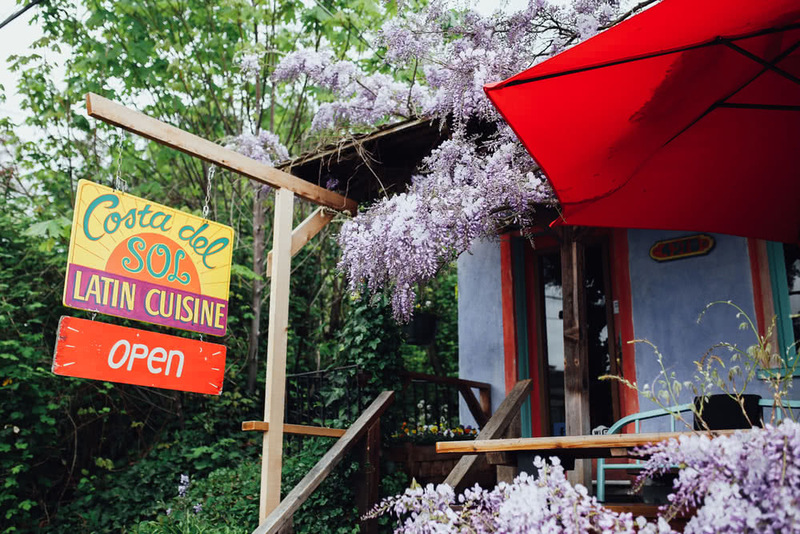 This restaurant is a favorite of many locals in Powell River. The owners are extremely personable, and the decor is punctuated by amazing local art from some of Powell River’s most creative artists. Costa Del Sol is located in another funky little house on Marine Avenue. They serve tasty latin-inspired cuisine with yet more great views over the Strait of Georgia. It is very popular in the summer months, but if get there early enough to grab one of the small tables sitting on the front porch you will be afforded one of the best seats in town! Good food with a west coast flair, and a great cocktail menu as well! Coastal Cookery is a place for locals to meet, relax and socialize at the end of the week, or even just the end of the workday. The atmosphere is warm and comfortable at all times of year. While in the summer the back porch is a fantastic place to watch the sun set over Vancouver Island. Thaidal Zone is an awesome, authentic Thai restaurant located right above the Westview Ferry Terminal in Powell River, one street below Marine Drive. They do all your favourites, served in a friendly and relaxed atmosphere with a great patio for enjoying warm summer evenings. Located up the hill in Westview on Glacier Street, Iguana’s is a friendly Mexican restaurant that serves big, satisfying portions and has great Mexican inspired cocktails to enjoy on a summer afternoon. Powell River’s second Japanese Restaurant, located on Marine Avenue in a cute little house that provides traditional Japanese and Korean dishes in a friendly and open atmosphere. Comfortable food. The Modern Peasant serves a wide selection of Canadian and North American inspired cuisine, from burgers to wild salmon to gourmet poutine. The restaurant is small, intimate and warm, with a great atmosphere and fully licensed bar. Check them out on Marine Avenue, right above the Comox ferry! Modern Italian cuisine “inspired by Italian traditions of quality local ingredients.” This new addition to the Marine Drive restaurant scene is a welcome addition to the Powell River fine dining landscape! The menu has been designed with sharing in mind, so bring your friends and enjoy the intimate atmosphere. Set above Okeover Inlet on Malaspina Road, on the way to our Penrose Bay launch site. 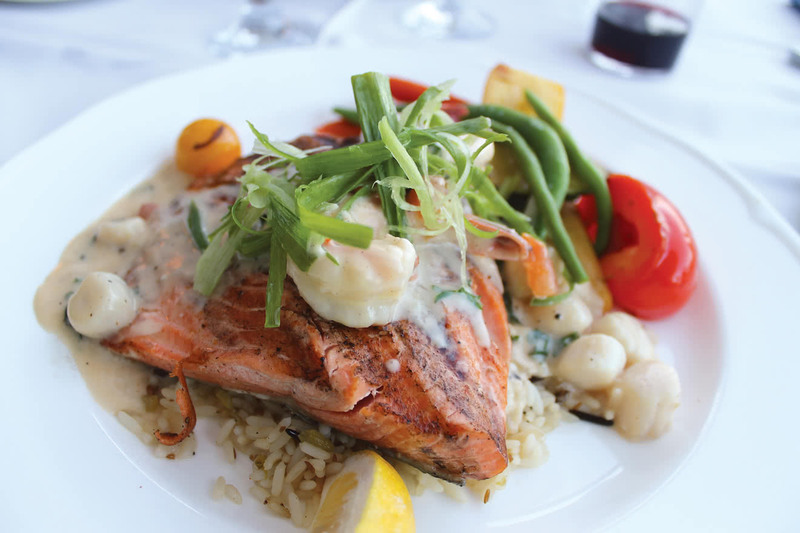 The Laughing Oyster has long been enjoyed as one of Powell River’s finest restaurants. The restaurant overlooks Okeover Inlet with incredible mountain and ocean views, and offers one of the best fine-dining experiences in the region. Specializing in fresh seafood, the menu endeavours to use fresh, local ingredients wherever possible. The setting, of course, is second to none. Magpie’s Diner is a Powell River institution. They serve big, hearty breakfasts and lunches in the Cranberry neighbourhood of Powell River. Summer weekends often see the line for admittance snaking out the door and into the street, and it’s no secret as to why: friendly service, bottomless coffee, and delicious comfort food! This breakfast place is located in the Old Courthouse Inn, in Powell River’s historic Townsite district, and has a comfortable diner-like feel and great hospitality. The cafe and inn is found next to the mill, and it is a piece of Powell River history. It once housed the courts, jail and police station early town, and the history has been carefully preserved by the owners. The food is plentiful and the coffee hot, making Edie Rae’s popular with guests of the hotel, locals, and visitors alike. 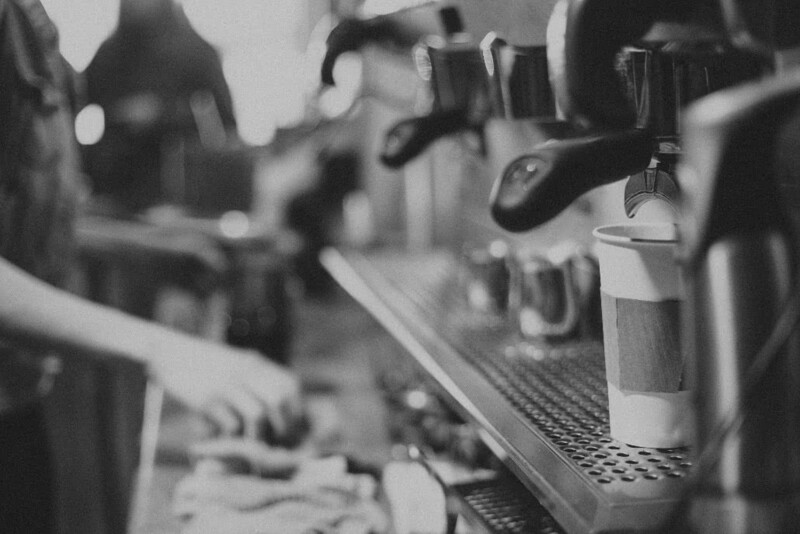 A mainstay of Powell River, with great coffee and genuine, friendly service. River City also serves tasty lunches and baked goods prepared in house to be enjoyed in the cafe or on-the-go​. Located in Crossroads Village, its open seating area is a great place to catch up with friends for a coffee, breakfast, or lunch. Base Camp is a small, funky coffee shop located on Marine Drive that serves great coffee and quick, tasty food. The cafe also endeavours to showcase local artists and promote outdoor activities and adventures within the Powell River area. Check out their breakfast sandwiches. 32 Lakes are a local coffee roasters with a new cafe location on Marine Drive in Powell River. Dedicated to showcasing local artists, they provide a comfortable, friendly atmosphere for locals and visitors alike.